Most of us have this image of the world in our minds. This kind of a map, today printed in almost every textbook, known as the Mercator’s projection was first created to make work easy for navigators. Even Google Maps uses a Mercator-derived technique to project the world on a flat surface. But, Mercator’s projection has only deceived our idea of geographical area for all these years. For instance, it has led us into believing that Greenland covers an area which is almost equal to Africa (Also, have a look at the size of Antarctica there. Gosh!). The comparison of these two land masses actually looks like this. 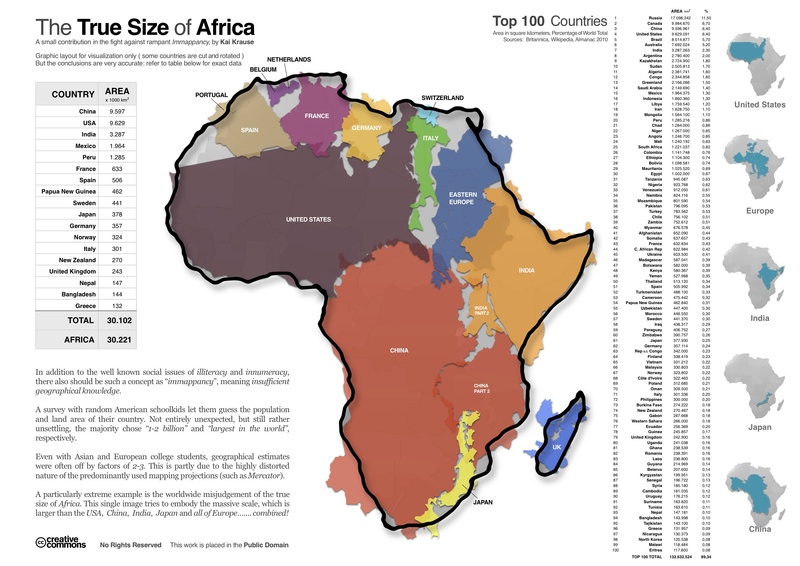 According to this infographic, the actual size of Africa is larger than US, China, India, Mexico, Peru, France, Spain, Papua New Guinea, Sweden, Japan, Germany, Norway, Italy, New Zealand, the UK, Nepal, Bangladesh and Greece, all of them put together. In short, Africa is around 14 times larger than Greenland. Do not underestimate its area. You can try playing with various combinations on this web app – map fight. Try these: Australia vs. Antarctica; US (contiguous) vs. Russia; and of course Greenland vs. Africa; they’ll leave you spellbound. Mercator’s projection, the devious one discussed above, for example, uses a cylindrical projection. That means, it stretches the areas on a globe, which are nearer to the poles. Hence, the imprecise size of Greenland and Antarctica. What is a perfect map, then? Even after developing hundreds of projection method, we haven’t been able to spot the perfect method, nor will it happen in the future. But, to get the right sense of area, a projection method known as the Peters (also known as Gall-Peters projection) projection, is said to be the most accurate (in terms of area). It is also one of the most controversial maps. Peter’s projection also has a huge fan following in spite of its terrible appearance. National Geographic started using the, good looking, Robinson projection from the year 1988, and used it for ten years, then, it moved to the Winkel-Tripel in 1998. An ideal Mercator’s projection would have infinite height if it doesn’t truncate some area near the extreme poles. Peters pointed that the Mercator’s projection made developing countries seem much smaller than they actually are. He said that these errors made the struggles of developing nations near the equator looks much smaller to the developed world. Next Next post: Deal with Poverty or Go to Mars?